Spray 2 1/2- to 3 1/2-quart slow cooker with cooking spray. In small bowl, stir together brown sugar and Caribbean jerk seasoning. Place pork tenderloin between sheets of waxed paper. Pound until 1/2 inch thick. Sprinkle with 1 teaspoon of the brown sugar mixture. Top evenly with apple slices and cranberries. Starting with one short side, roll up; secure with string. Place sweet potato slices in slow cooker. Top with pork roll. Sprinkle with remaining brown sugar mixture. Cover and cook on low heat setting 4 to 5 hours. About 5 minutes before serving, in 1-cup microwavable measuring cup, stir together water and flour. Remove pork to cutting board. Remove sweet potatoes to serving platter. Stir juices from slow cooker into flour mixture. Microwave on High 30 to 60 seconds, stirring once, until mixture boils and thickens slightly. 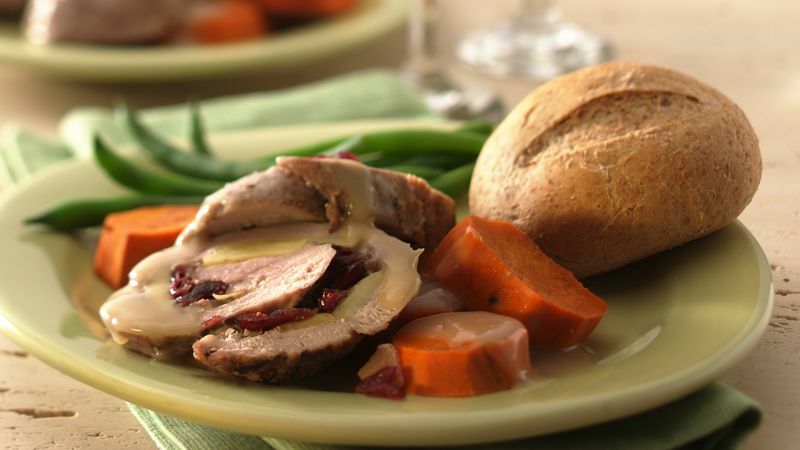 Cut pork into slices; place over sweet potatoes. Pour sauce over top. If desired, add salt and pepper.